How long does it take for a crocodile to adapt to a new hemisphere? 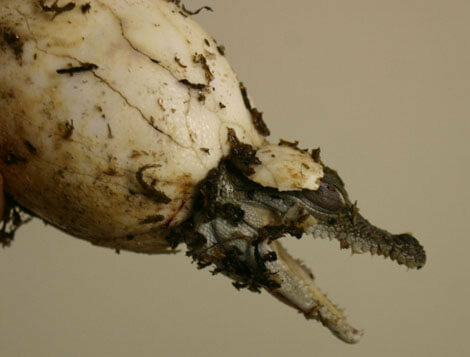 In a past article I discussed the importation of a pair of adult saltwater crocodiles Crocodylus porosus from Australia (CSG Newsletter Volume 23, Number 1, Jan.-March 2004) I have always wondered how long it would take a female crocodile from one hemisphere to switch seasons and start laying eggs in a different hemisphere. I generally assumed that it would take a couple of years or more for her to make the transition. The St. Augustine Alligator Farm Zoological Park imported a pair of adult saltwater crocodiles from Australia on October 24, 2003. The female was gravid at the time of importation and laid a clutch of eggs in the water within a month of arriving at our facility. The eggs she laid were fertile as evidenced by the band that developed on each egg. One and a half years after her arrival, our female saltwater crocodile made the transition to our spring season, and on May 25, 2005 she laid 35 eggs. These eggs have also banded. This time she laid most of the eggs on land. She was most unfortunately interrupted by the 15-foot male crocodile that is on exhibit with her. While she was laying her eggs, I snuck in the exhibit to video the event. The male noticed me and started approaching. I attempted to push him back with a bamboo pole, but he reached up and grabbed her by the tail and pulled her in the water. She seemed pretty shocked by this, but did not let it slow her down. She laid several more eggs in the water and then crawled back to her nesting location and laid the rest of her eggs. She covered the nest as a good crocodile should and is very defensive of that entire nest location. You can see a short video clip of Sydney (our female saltwater crocodile) being pulled off the nest by Maximo (our 15’ 3” male saltwater crocodile) in our video section. He outweighs her by more than 1,000 pounds. Even so, she seems unharmed by the event.